American author, editor, and librarian; born at Friedrichstadt, province of Courland, Russia, Oct. 6, 1843; educated at Bauske and Jacobstadt, graduating in 1859. In this year he translated into German several of Nekrassov's poems. In 1869 he engaged in the printing trade at Krementchug, and in 1870 he published a collection of poems, "Gedichte." In the Russo-Turkish war he served in the Russian Red Cross Society and received the society's medal for distinguished service (1877-78). Returning to his craft as master-printer, he pursued it in Smyela,government of Kiev, and in the city of Kiev until 1881. He produced a humorous story, "Die Wunderliche Kur," in 1872, and later assisted in the founding of "Zarya" (Dawn), a daily paper, the first number of which appeared at Kiev in 1878. At this time Rosenthal was elected corresponding member of the St. Petersburg Society for the Promotion of Culture Among the Russian Jews. Interested in the condition of his oppressed coreligionists, Rosenthal sailed for the United States in 1881 for the purpose of founding there agricultural colonies to be settled by Russian Jewish immigrants. During 1881-82 he succeeded in establishing colonies in Louisiana and South Dakota. He also took a prominent part in the administration of the Woodbine (N. J.) colony in 1891. During 1887 and 1888 Rosenthal engaged in the book-trade, but gave up this occupation on being appointed chief statistician of the Edison General Electric Company, a post that he held for three years. In 1892 he went to the Far East, whither he was sent by the Great Northern Railroad Company to investigate the economic conditions and trade of China, Korea, and Japan, on which he published a report (St. Paul, 1893). On his return he was elected secretary of the German-American Reform Union, New York city, and a member of the press bureau of the Committee of Seventy. In 1894 he was appointed chief of the discharging department of the Immigration Bureau, Ellis Island, New York, an office he occupied two years; and in 1898 he accepted the post of chief of the Slavonic department, New York Public Library (Astor branch), a position he still (1905) retains. He joined the editorial board of The Jewish Encyclopedia as Chief of the Russian department in Dec., 1900. Rosenthal has been prominently connected with Hebrew literature and with the development of the Haskalah movement in Russia. 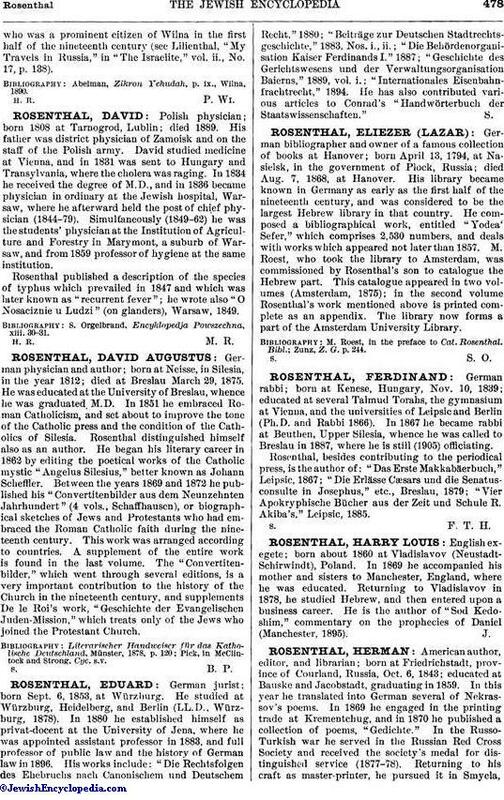 He contributed (1859-67) to "Ha-Meliẓ" and other Hebrew periodicals, and corresponded with Reifmann, Leon Gordon, Zweifel, Zederbaum, Fuenn, and other Hebrew scholars. In the United States he edited and published, together with A. Rosenberg, the Hebrew monthly "Ha-Modia' le-Ḥodashim" (1901). In 1894 Rosenthal founded the society "Ohole Shem," of which he is still president. Rosenthal translated into German verse "Ecclesiastes" ("Worte des Sammlers"), New York, 1885, 2d ed. 1893, and the "Song of Songs" ("Lied der Lieder"), 1893, and, into English, a work by Hugo Ganz, "The Land of Riddles," New York, 1905. 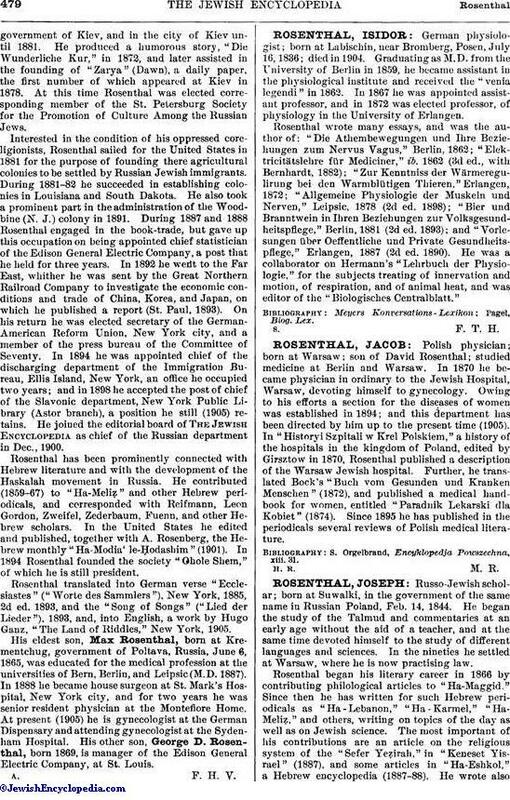 His eldest son, Max Rosenthal, born at Krementchug, government of Poltava, Russia, June 6, 1865, was educated for the medical profession at the universities of Bern, Berlin, and Leipsic (M.D. 1887). In 1888 he became house surgeon at St. Mark's Hospital, New York city, and for two years he was senior resident physician at the Montefiore Home. At present (1905) he is gynecologist at the German Dispensary and attending gynecologist at the Sydenham Hospital. His other son, George D. Rosenthal, born 1869, is manager of the Edison General Electric Company, at St. Louis.